Want To make video calls or want to chat with your friends on video chat but don’t have your Webcam or your webcam got broken? don’t worry you can still make video calls and you can video chat with your friends like on Facebook or Skype or anywhere on the internet. If you have a android phone you can turn your android phone into a webcam by using a android app called Droid Cam 2.0 this app can help you to turn your phone into a PC compatible webcam which you can use anywhere for video chat or video call to turn your android phone into a webcam this app is tested on all major windows operating system like winnows 7, windows vista, XP 32 bit etc. just follow the simple steps below. 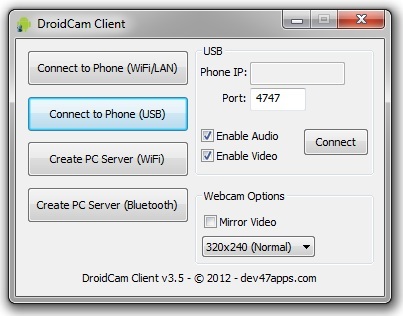 1-To turn your android phone into a web cam you need to install Droid Cam 2.0 on your phone. 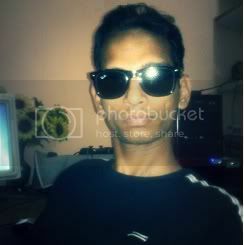 2- After installing this app into your android phone you will need Droid Cam 2.0 windows client which will help you to connect your phone with your PC to use your android phone as webcam now Click Here to download the Droid Cam client. 3- Just install the windows version on your PC, you can use your phone as a webcam by using a WiFi network or you can use it with your phone data cable. 4- After downloading the Droid client it automatically integrates into your system now you can use your phone as a web cam just go to your chat platform like messengers, Skype, or Facebook video chat and select Droid Cam as your web cam make sure you have enabled voice and video setting on the chat window. 5- You can manually connect your phone to Droid client just go to your start menu and open Droid cam and then just select how you want to connect your phone if you want to connect or use your phone as a webcam by using USB cable then select connect to phone (USB) if all goes right you will get a message saying ‘connected’ that’s it now go to your chat window or if you are using Skype it will automatically show Droid Cam to select, just select and start chatting with your phone as webcam.